I have this rule with eating. I will try anything at least 3 times before I determine that I dislike something. It rarely happens but there are certain foods I just do not like. Anything licorice flavored, clams, oysters, liver and octopus are few things on my list of strike outs. My best friend Michelle used to be the pickiest eater ever, and I mean EVER. I would have to force her to try anything new and I slowly opened up her palate to all of the awesome flavors she was missing because it looked gross. The point of this story is that last week she came over and requested something for dinner that she would’ve never wanted before. 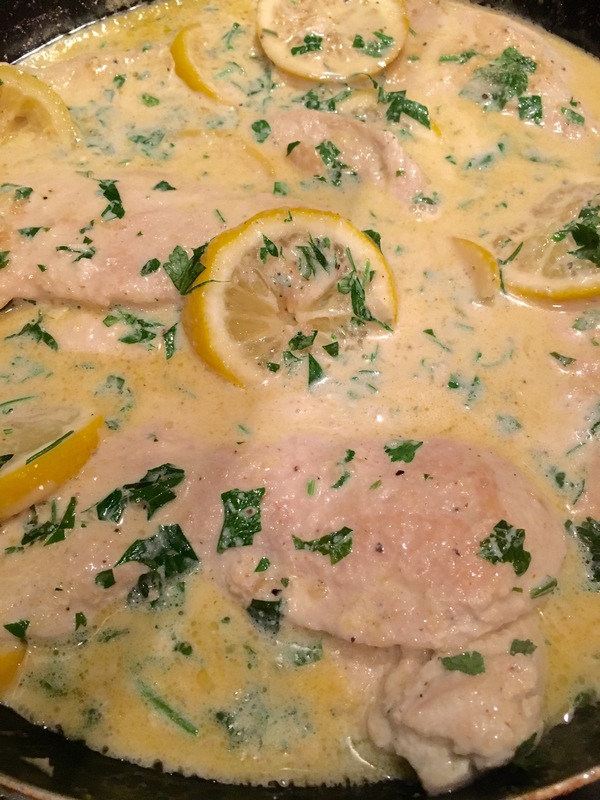 Lemon butter chicken. Although I never made chicken this way, the flavors were simple and really worked perfectly together. Lemon is a hot or miss taste. You either love it or despise it. I happen to love it. It’s light and refreshing and really adds flavor that seasoning can’t. It is also a great preservative that keeps whatever you are cooking fresh and on point. Although I was not planning on coming out of this meal with a recipe, I am glad I did. I decided to make the sauce cream based. I usually dislike a heavy cream sauce so I made it on the lighter side by using 1/2 pint. 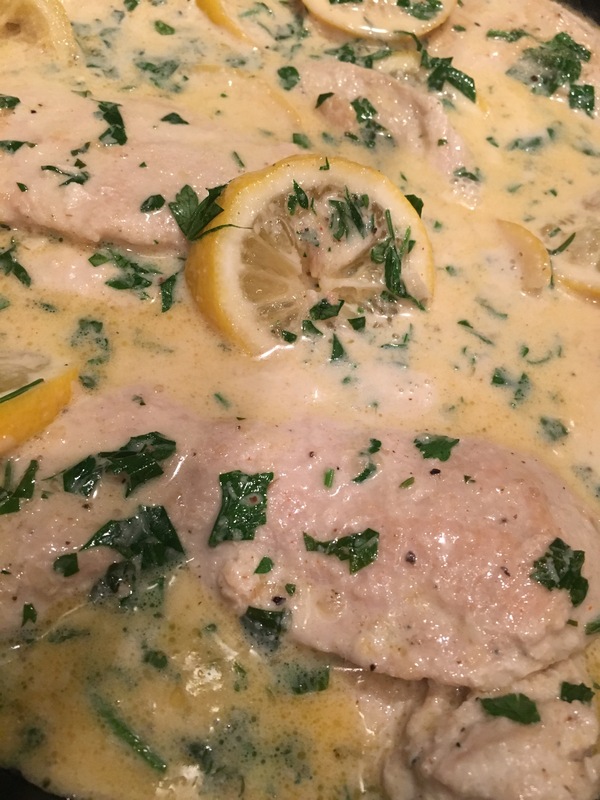 It was the perfect addition and thickened the sauce with out destroying the delicate flavors. 2 large lemons sliced, preferably no seeds. if you have seeds get rid! In a large non stick skillet, melt 1 tbsp of butter on medium heat. While that melts, season your chicken cutlets on both sides with a little salt and pepper. Add to your skillet and let chicken cook. Does not have to be brown unless you prefer a little crunch. Once they are fully cooked, remove and set aside leaving the chicken juices in the pan. In the same skillet on medium heat, add the rest of your butter and your garlic and allow it to cook for about 2 minutes. Do not brown the garlic. You want to loosen any of the chicken juice from the pan allow it to cook with the butter and garlic. Add your lemons and cook for about a minute to warm the juices up. Once the butter and garlic cook together for about 2 minutes, add your heavy cream. Give it a stir then add 1 tsp of salt, 1 tsp of pepper, 1 tsp of garlic powder and 1 tsp of onion powder. Let it come to a slight simmer and lower your heat. Add your chicken and let cook for about 10 minutes so the chicken can absorb the flavors. Check for salt and pepper adjustments. Turn the heat off and enjoy!